The Selection tool allows you to select a rectangular area of your image that can then be cropped, saved, masked, etc. Click and drag a rectangle around the area of interest. Clicking inside a previously set selection will popup a menu of additional choices. The Remove Selection menu item will completely remove the selection. The Crop to Selection menu item will crop the image to just the area of the selection. There two menu choices will copy the contents of the selection area to the Windows clipboard. 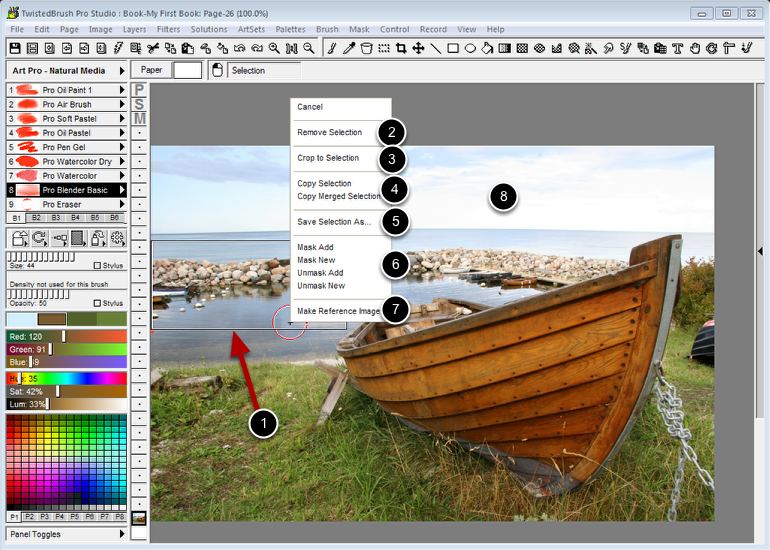 The Save Selection As menu item will allow the selection area to be saved to an image file. These menu items are used to set or adjust a mask. The Make Reference Image menu item will make a reference image from the selection area. Clicking outside of a current selection area will start drawing a new selection rectangle, removing the old one.